When Lilacs Last in the Dooryard Bloomed is an upcoming release by author Bradley Greenburg and today I have an excerpt to share with you! Clayton McGhee learned to read from Lenore Peacham, in whose store he had worked since their arrival in Nashville in the autumn of 1866. It was called Peacham’s Dry Goods but even after the war ended the stock scarcely matched the description. Stores sold what they could get. When there was flour they sold flour. When berries and tomatoes and beans were in season they offered them. When bolts of cambric and gingham, or even huckaback, came available they reprised their role as the purveyors of millinery and sundries. The Peacham store had a generous awning and long benches on either side of the door which were never without takers. In their first week in town Clayton was sent by his granny to buy flour, sugar, and molasses. She put the coins firmly in his hand, gave him detailed instructions as to amounts, then made him repeat them back to her. Don’t bring me no magic beans, she’d said, slapping his behind and sending him running. Though it was only two streets away, Clayton had been nervous. Montgomery was a small town that just kept going. Nashville felt huge. In the street he repeated the weight of each item as he walked, cautiously minding the horses and wagons that trundled by in every direction. He stopped to admire the artistry of a burly fellow who rolled a full beer barrel down a wooden ramp, tipped it on its end, then spun it at an angle onto the groaning boards of the sidewalk and in the front doors of a saloon. A teamster yelled at him to get the hell out of the way and he ran into the mouth of an alley as a man in a blood-colored suit roared past, whipping a matched pair of jet black horses. His heart was beating like mad and he remembered clearly his granny’s other admonition: he was not to get killed on his way to or from the store. ‘Left us a cross stuck in the road,’ James said, his voice low but distinct over the whetting of the knife. ‘Likely they read in the papers about them white sheets down to home. They been out here a couple other times, at night. Just to look. They ain’t killed or took nothing yet.’ ‘Yet,’ Cmicky repeated. The end of slavery is no guarantee of freedom. When 12 year old Clayton McGhee journeys north with his parents and grandparents in search of a new life, they must build a homestead with their own labour and defend their right to own land from powerful vested interests and deep rooted prejudice. Thirty years later, Clayton is still forced to defend his livelihood and his family’s safety from racism and greed. But life is more complex now, as the men of influence in this increasingly mixed community find to their cost. 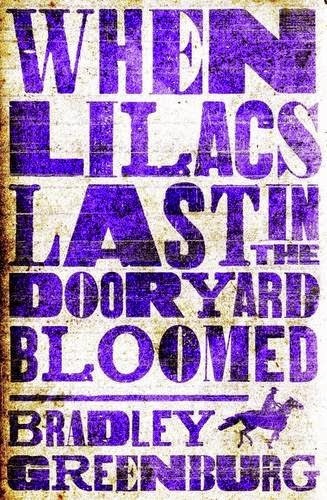 When Lilacs Last in the Dooryard Bloomed charts the massive changes in the United States following the death of Lincoln. It’s also a riveting adventure story about fathers and sons and the difficult moral choices which resound down the generations as America moves haltingly towards freedom and equality.